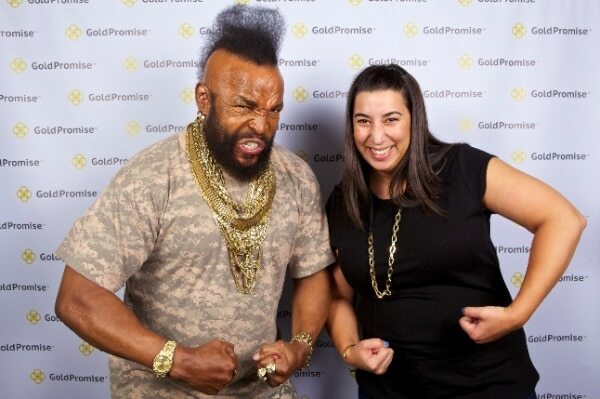 LATB had the amazing experience to sit down to lunch with the iconic Mr. T while he was in New York making the rounds at Bloomberg, Howard Stern, the Wendy Williams Show and others to announce himself as the new spokesperson for Gold Promise, a cash-for-gold company that promises to beat online competitors price for gold by 200%. In person, Mr. T was every bit as charismatic and entertaining as his on screen persona made famous in Rocky III and the A-Team and, true to form, his new Gold Promise commercials were a riot. The commercials depict Mr. T, now flush with cash from selling some of his old gold, using his new windfall to try new things, like golfing and acupuncture, with predictably comical results. I can’t put my name on something I don’t believe in. It goes back to my upbringing. My mother taught me that a good name is worth more than silver and gold. I like to do a good job and believe in what I do. I believe in integri-T, loyal-T, hones-T. I bought my first gold chain back in 1977. It was $129. I didn’t have a lot of money then, so it took me a couple of months to get it out of the layaway. I remember back in the 80’s when a lot of people wanted to buy gold like me, I told people, it’s ok to have gold, but don’t buy gold if the rent’s not paid. When I started buying gold, it wasn’t until after I bought my mother a house… You see, behind my tough exterior is a marshmallow…a pussycat…but not a wimp! People ask me, what does the “T” stand for? To the women and children, the “T” stands for “Tender”. To the bad guys and thugs…POW…the “T” stands for “Tough”. To see the hilarious Mr. T commercials, or for more information on Gold Promise, visit their website at www.goldpromise.com. My neighbor just had his picture taken with Face and Murdock, but this is so much more awesome! Okay, I gotta say it – when I was a kid, I ran into Mr. T while my mom and I were shopping on N. Michigan Ave in Chicago. He was SOOOOO rude and mean and TO A KID! I couldn’t believe it. I still need therapy, lol. Absolutely true story though….what a jerk.